Whether you’re brand new to the world of horse racing or you’re an old pro, improving your knowledge on the sport can only benefit your betting skills. Following is a guide to assist you in becoming accustomed to the world and terminology of horse racing. You may have only placed the odd bet once or twice a year on major races such as the Grand National. You may have played it safe by only betting each-way because you weren’t confident enough to pick an outright winner. Or when you did pick a winner, it was the No. of your birthday. Well, if any of those “strategies” sound like you, this section will help you understand the various types of races and bets. The type of bet that more experienced punters are attracted to is the “win” bet. While there’s something to be said for each-way betting, most professional gamblers believe that betting on the winner is the best way to profit. Each-way betting is ideal for punters who feel confident that a horse will perform well but unsure whether they have the ability to win the race. They profit if the horse finishes in second or third place in a race featuring at least eight runners. If it’s a handicap race with at least 16 runners, fourth place also pays. There are certain races where even fifth place pays out. There have been numerous stories about gamblers winning big from a small stake by linking numerous winners. This type of bet, also known as an accumulator, can be a basic double to a maximum of seven or eight horses. Of course, the downside with this type of bet is that you lose your stake with just a single loser. There are a number of special bets that enable you to link horses in not just accumulators but also doubles and trebles. The Patent bet links three horses in three single races, two doubles, and a treble. The Yankee bet totals 11 bets with four horses in doubles, trebles, and a four-horse accumulator. The Canadian bet is five bets and the Heinz is six, with 26 and 57 combinations, respectively. Betting exchanges are among the more recent innovations in horse racing where punters can act as the bookie and take bets from other punters. They offer a bet on a horse that they don’t believe will win. To apply this strategy, you’d need to ensure that you have sufficient funds in your account to cover for any losses. These losses can be significant so ensure that you have a thorough understanding of what lay betting involves before you go down that route. Winning odds are returned as starting prices (SP). You can get the odds before the race while hoping for a more favourable price. Most bookmakers will give you a guarantee of best odds, so if the SP is better than your earlier price, you’ll still get the greater odds. This isn’t the case with ante-post betting where your stake is at risk should the horse fail to run. This is applicable unless the race is marked “non runner – no bet” when you place your selection. There are a number of things to take into account when choosing your runner. Here are the key terms and factors that help to determine the results of any race. There’s more variety in British and Irish racecourses than anywhere else. The draw and the track can be determining factors of how a race plays out in the UK. While low numbers are detrimental to sprint races at Ripon, for example, it’s the other way around in Chester. The going is also something that you need to take into account when choosing which horse to back. While the majority of horses run to form on good ground, there are also cases with extremes of going. Some horses have a preference for heavy or soft ground while others perform at their best on fast racing ground. Races vary in distance, both over jumps and on the flat. The shortest race is five furlongs in UK flat racing. The longest takes place over two and three-quarter miles. Certain horses perform at their best over certain lengths. A horse with a track record of success over five furlongs, for example, could struggle over eight furlongs. In jumps racing, the shortest race is two miles, with the longest being four and a half miles. Some trainers are more popular with punters than others, such as Nicky Henderson for jumps and Aidan O’Brien for flats. There are a wealth of stats available that detail trainers’ records in various courses and race types, as well as current form. Like trainers, certain jockeys are favoured by most punters, such as Ruby Walsh and Ryan Moore. There are also statistics on jockeys. Every single jockey in the UK is of an exceptionally high standard, however, so the difference between them isn’t necessarily as great as you might imagine. You’ll need to have a firm grasp on the two distinct codes of races: National Hunt Racing and Flat racing. Both take place all year round. For flat racing, horses are trained from just two-years-old. They start running in maiden races. While this is a slightly riskier bet, it can be great training ground for the punter as it gives him an idea of which horses look like they’re going to be winners in the future. The larger stables often allow two-year-olds who are slow to mature a race or two when the season is ending. This gives more experience to the horse. By watching these races over again from the major tracks, you may decide that there are certain horses you want to keep an eye on. In handicap races, each horse is weighted to have the same chance of victory as each of his fellow runners. An official rating is assigned to the runners based on recent form. A horse with a 100 rating, for example, is rated 10lbs superior to a horse with a 90 rating. At a single mile, 2lbs equal one length so the horse is rated five lengths superior. These races have proven difficult to predict in the past but remain popular among punters who can typically get better odds for their chosen runner. The purpose of these races is to establish the best runner, typically as weight-for-age or level weights. Races are categorised by classes, with Group 1 being the highest. Bookmakers don’t offer very favourable odds to the best horses but there’s shortage of competitive Group races to have a flutter on. National Hunt Flat races (aka Bumpers) only feature horses that are taking to the flat for the first time. These races first came about to provide experience to National Hunt breed horses that were late to mature. They grew in popularity, however, and now Aintree and Cheltenham host championships in this division. Opportunities to bet on these races are few and far between, which doesn’t help when trying to gauge form. They can be helpful in spotting tomorrow’s novice hurdle wins, however. Novice events are similar to maiden races on the flat. Horses can take part in novice hurdles from three-years-old and it isn’t uncommon for a horse to transition from flat to hurdles come winter time. Horses may win multiple novice races but not without penalty. Novice chases are some of the riskier races for a punter with horses having no prior experience of jumping over fences. It’s typically advantageous to wait and see how the horse jumps before having a flutter on these races. You will also need to factor in the racecourse as the fences at Aintree or Cheltenham are much stronger than those on the smaller tracks. The handicap system for the jumps isn’t dissimilar to how it works on the flat, with the one difference being the weight-to-distance ratio. Many of the top jump races, including the Grand National, are handicaps. The advantage of National Hunt horses is that they typically remain in training for far longer than flat racing horses. This allows you to learn their best racing distance, ground preferences, and course. Top-level National Hunt races are termed Grade 1 races. They include the Champion Hurdle and the Cheltenham Gold Cup. There are a number of different Grade 1 races that take place over the course of the season with varying distances. The championship races are at Punchestown, Liverpool, and Cheltenham. England hosts five classic races: St Leger, Oaks, Derby, 1000 Guineas, and 2000 Guineas. These races are an opportunity for three-year-olds to shine and prove that they can stand out above their peers. Both genders can race over a mile in the St Leger and at Doncaster over three-quarters. St Leger, Derby, and the 2000 Guineas comprise the English Triple Crown. Nijinsky was the last horse to claim victory in each of the three races in 1970. Camelot came close when he won the first two in 2012 before coming second in the St Leger. The five classics then take place in Ireland, with older horses running alongside three-year-olds in the St Leger. Royal Ascot is the largest flat racing meeting in June. There are 20 races that take place over five days, including 19 Group races. There is also £7mn in prize money to be won, with highlight races including the Diamond Jubilee Stakes, The Queen Anne Stakes, The Prince of Wales’ Stakes, and The Ascot Gold Cup. Other major Festival meetings on the calendar include the York Ebor Meeting, the Newmarket July Festival and Glorious Goodwood. These events attract some of the world’s top horses. March’s Cheltenham Festival is the grandest occasion for National Hunt racing. The Cheltenham Gold Cup is the championship for chasers running over three and a quarter miles. The Cheltenham Hurdle is the biggest race for hurdlers running over two miles. The meeting’s other top races include The Ryanair Chase, The Stayers Hurdle, and The Queen Mother Champion Chase. Steeplechasing’s most sought-after prize is April’s Grand National in April. The race takes place over four and a quarter miles. Other main staying chases include the Irish Grand National, The Scottish Grand National, and The Welsh Grand National. Every single one of today’s thoroughbreds is related to one of three stallions: the Byerly Turk, the Godolphin Arabian, and the Darley Arabian. They were bred to European and English bloodlines in order to create the very first thoroughbreds. Horse racing has a long history of tradition in the UK and has inspired a large number of races across the globe. The rules were established with the first Newmarket Town Place in 1666. Aristocracy and the Royals soon adopted it as a favourite hobby of theirs, which led to the term, “The Sport of Kings”. 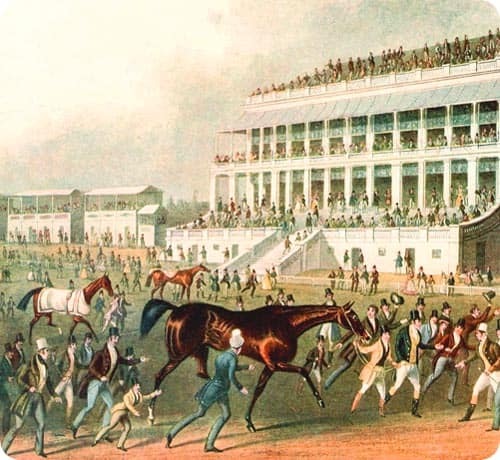 The St Leger made its debut in 1776. The race was the first of the five Classics and arrived four years prior to the first Derby Stakes. The term “Derby has since been adopted by the likes of The Kentucky Derby. The Cheltenham Gold Cup was a flat race run when it began in 1819, not becoming a steeplechase until 1924. The Grand National debuted in 1839 and now offers £1mn in prize money. Our guide to betting on the horses in the UK will hopefully see you starting your path to not only enjoying the sport, but also profiting from it. If you really do intend on making money with your new-found knowledge of betting, ensure to track your results. Having statistics at hand of your record so far will help you to stay on track. While horse racing is as entertaining as it is competitive, it’s a lot more fun when you’re winning. You can’t keep your eye on the form of every single horse in the country, but you’ll come to know the types of races that you have enjoyed more success in. You’ll also be able to forego betting in any kind of race where victory seems to elude you. Most importantly, ensure that you don’t bet beyond your means and remember to enjoy it.